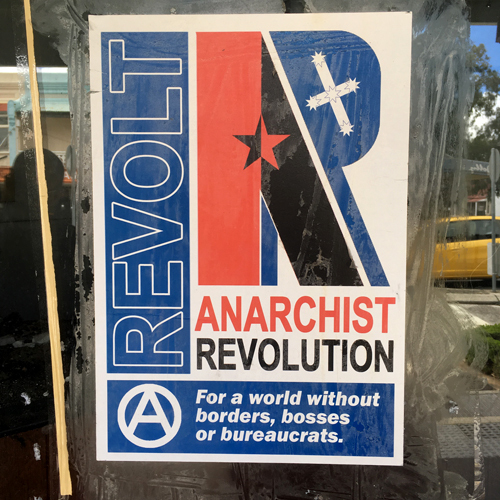 Honestly – you can barely move for anarchist posters around the ‘hood. Amazingly, the internet-free exercise was a lot less challenging than I’d anticipated. I suspect this was mostly because I had my head shoved in a book, which was probably not entirely in the spirit of the endeavour, but which enjoyed nonetheless. Interestingly, each time I passed my desk I had the urge to sit down and put hands to keyboard. Of course I resisted because of the project, but wow – I do actually do this all the time – and must lose hours and hours to it! And I felt, well, relaxed. Really relaxed. And the day felt long and luxuriant – even though I’d slept in until 7:15am (thanks kitties!) and so had an hour less than usual to play with. So, I’m planning to extend this – give myself an internet-free week. Obviously there will be internet at SML, but for home I’m going to attempt to stay away off Monday 12/02. It will break the daily blog posting chain, but I’m keen to see how this works and what I do with my time. Will of course report back! Good thing today: Managed my second 2 day of 5:2. Getting back into it wasn’t as difficult as I expected, as is the way of most things.